1) Farmville – This game was developed by Zynga, and is now one of the most popular in the world today. It was launched in June 2009, and now has over fifty million players. You can grow your own crops, raise farm animals, construct farm buildings, and visit other players’ farms as well. All along, you unlock “coins” that help you advance to the next level. These coins can also be bought using credit cards. It’s truly addictive. 2) Mafia Wars – While Farmville is a pleasant, laidback experience, Mafia Wars takes you into the dark underbelly of Facebook. This is a game for the down and dirty. You are the Don of your family, and it is your job to establish yourself as the most powerful one online. You can gain control of other mobsters, and travel to Cuba or Moscow to become an internationally acclaimed super criminal. You must kill a rival family’s Don in order to win at this game. 3) Farm Town – A very similar game to Farmville, you can grow crops, but you need to give them constant care and attention. You can do it yourself, or hire workers for you, from amidst your online community. You are rewarded in coins for your efforts. This game is very colourful and vivid. 4) Pet Society – This is a world that you can share with your pet. You can play games, build and decorate your own house, and even bring your friends home. You can always buy items to upgrade your game experience. You win Paw Points for overcoming specific challenges. 5) Texas HoldEm Poker – You’ve always wanted to gamble, but you aren’t 21 yet. Or if you are, you’re probably worried that you’ll lose all your savings. This game turned Poker into the coolest thing on the Internet. Developed by Mark Pincus, this game revolutionized Facebook. You can earn chips by taking up offers, or adding applications to your profile. If you lose them all, you need to participate in certain Facebook promotional activities in order to get more. Gambling has never been more fun, or more economical! MMOs are the fastest, simplest way to get hooked to your Facebook account. If you log in to Facebook and see some people online all of the time, chances are, they’re playing one of these games. There’s a host of other great games on Facebook that you might want to try. 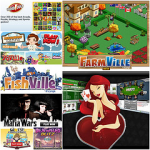 These include YoVille, Mind Jolt, Restaurant City, Bejeweled Blitz, and Friends For Sale, to name just a few. These games are a great experience, whether you are looking for a new hobby, or just trying to kill time. So log in to Facebook right now, and sign up! Gaming has never been more fun! But don’t get carried away 🙂 Remember Time is Money!